Play & Pray sessions always include a cosy corner to cuddle up with your child and read. These are some books we especially love. In this gentle, meditative story, a little girl and her mother take a night-time visit to the sea in the silvery moonlight. The luminous pictures show the bond between parent and child, and how a simple experience can become a rich memory. The little girl knows that, ‘I’ll always remember just Mum and me and the night that we walked by the big big sea’. A beautiful, entrancing book. In characteristically zany and flamboyant rhyming text, this thoughtful book by Dr Seuss describes emotions in relation to colours. The vivid illustrations, not by Dr Seuss but commissioned after his death, celebrate and acknowledge human feelings without judgement. The moods range from, ‘Grey Day…Everything is grey. I watch. But nothing moves today’ shown by a static, watchful owl, to a lively, chaotic tangle of flamingo legs: ‘But when my days are Happy Pink it’s great to jump and not just think’. Based upon a traditional African fable, this moving story tells of the special life purpose or God-given ‘song’ with which everyone is born. Deo’s mother ‘listened in her heart until she heard the special song of me’, which she sings with his father, ‘inviting me to come to them’. The song is sung during pregnancy, by the people of the village to welcome the baby Deo, and to mark the boy’s achievements and failures, his coming of age, marriage, and is finally sung in farewell at his death. The large, generous watercolour illustrations are expressive even to younger children. Finally, the reader is invited to ‘Take deep breaths, and listen deep inside your heart. Can you hear your song?’. Recently published in January 2014, this is a poetic retelling of the creation story, with an emphasis on God’s love and delight for the world: ‘on the seventh day, God laughed, and rested, and enjoyed his glorious creation’. The unusual illustrations are dreamlike and fanciful, and awash with digitally-enhanced sparkles. A fable set in the newly created world, in which ‘no one knew the name for God. So each person searched for God’s name’. Names for God include ‘Maker of Peace’ to the tired soldier, ‘Redeemer’ to the freed slave, and ‘Friend’ to the lonely child. Finally, the people recognise God in their own communal reflections, and their diverse voices come together to call God ‘One’. The bright pictures are full of appealing detail and interest. This charming American children’s classic was first published in 1942. In it, a little bunny is determined to run away, and his mother assures him that she will be there for him. ‘”If you become a crocus in a hidden garden,” said his mother, “I will become a gardener. And I will find you”‘. Simple black and white line drawings are alternated with wordless double-paged spreads in full colour, which give the reader pause. The story evokes God’s relentless, ever-pursuing love in Psalm 139, ‘O Lord, thou hast searched me out and known me’. With bright, splashy paintings, this quirky book gives strong expression to the love and adoration showered on three toddlers by their grown-ups. We meet Little Guy and his daddy, Little Pumpkin and a glamorous blonde grandma, and sleepy Little Bird with her mama, and they fill the pages with their exuberant running, swinging, kissing, and rocking. The characters are ethnically diverse, but all share the same tenderness. The warmth of their love can’t fail to extend to the readers. A memorable parable of conflict and confusion on earth, which is calmed by the wise voice of Old Turtle, a prophetic figure. She says, ‘God is all that we dream of, and all that we seek…all that we come from and all that we can find. God IS’. With a complex text and subtle paintings, perhaps this picture book is especially for adults, even more so than for children. The Shaker song, Lord of the Dance, unfolds with vivid, detailed watercolours on the centre of each page. Accompanying Bible stories are told in side columns. So, for example, the words, ‘I danced on the Sabbath And I cured the lame’ are matched with Luke 6:6-11 where Jesus heals in the synagogue on the day of rest. A piano arrangement of the song and instructions for simple dance steps are included. This book reads beautifully at different levels, starting for young children with the song words and engaging illustrations. A book rich with the traditions and rituals of a Jewish family, and the reassuring love between a child and grandmother. Jennie and her Nana prepare for the Sabbath by cleaning the house, polishing candlesticks, and baking chicken, apple pie and challah breads. The family arrives in a swirl of snow and finally it’s the best time: ‘Nana is lighting candles and our dresses are touching and she is whispering Sabbath prayers and no-one makes a peep’. The colourful pictures are full of absorbing detail. A true wartime story, in which a woman, Ruth, is reunited with the beloved doll she left behind as a child when fleeing Germany of on the eve of Hitler’s rise to power. The subject is Ruth’s affection for the doll, an attachment and loss to which young children can relate. Although the Nazi context is poignantly apparent to the adult reader, to a child it appears alongside the equally baffling but benign curiosities of bourgeois life in 1930s Munich: a frog kept in a jar with a ladder to predict the weather, and a pet African turtle big enough to ride on. Claire Nivola’s memorable folk-art style illustrations are to be treasured. This is a true story of the author’s quilt, made a century ago by Russian-Jewish immigrants to the USA from a basket of old clothes: ‘Anna’s babushka, Uncle Vladimir’s shirt, Aunt Havalah’s nightdress, and an apron of Aunt Natasha’s’. The quilt is passed from mother to daughter, and plays a role in rituals (Sabbath tablecloth, wedding canopy) and everyday life (picnic rug, baby receiving blanket, and cosy lap rug in old age). The moving black and white pencil drawings show vivid human expressions, and only the quilt appears in colour. A lovely, memorable representation of family traditions and succeeding generations. A wise and thoughtful response to sibling rivalry, in which a mother diplomatically celebrates her sons’ different qualities on a fishing trip; ‘Why, Julian, you took the deepest strokes. And Max, your strokes were fastest’. She also has a clever answer to the question, ‘Who do you love best?’. She loves one ‘the bluest’, the other ‘the reddest’, creating a deep ‘purplest’ affection for the boys she loves best. This book probably won’t end competitiveness between your children, but it provides a loving and reassuring perspective. Two foxes, parent and child, explore unconditional love in witty rhyming text and pictures. Things start badly with Small’s ‘grim and dark’ tantrum, and Large responds that ‘Grumpy or not, I’ll always love you not matter what’. Small tests this, ‘What if I was a crocodile?’, ‘Does love wear out…does it break or bend?’, and is reassured. Small finally asks whether love goes on even when we are dead, to which Large has a good and memorable answer. Debi Gliori creates a familiar and comforting sense of the everyday – bad moods, mending toys, bedtime toothbrushing – in which to set these profound questions. Babba Zarrah tells stories to the children from her village, deep in the snow-covered mountains. They sit on her knitted story blanket, which she slowly unravels for the wool to make presents for her neighbours. When the villagers realise her generosity, the story blanket is gone, so they all donate wool from their homes for a replacement, and the cycle of sharing and giving resumes. This sweet parable of community cooperation is illustrated with fun, quirky pictures. An old song, described by Dorothy Butler in Babies Need Books as ‘probably the most lulling number rhyme…a wonderfully warm, drowsy contentment’. Ezra Jack Keats has created richly glowing collage pictures and marbled paper for this version. Every baby deserves to enjoy the ‘old mother turtle and her little turtle one’ and the life-affirming birds who ‘sang and were glad in the hole in the tree’. This unsentimental book describes earthly lifecycles and lifetimes with a calm but unwavering firmness: ‘There is a beginning and an ending for everything that is alive. In between is living’. The focus begins with the natural world, and then extends to people, explaining that lifetimes share the same pattern. The soft drawings show new life (eggs in a nest), pain (a child’s splinter being removed), death (the broken body of a butterfly), and many flourishing natural creatures thriving in their own lifetimes. In spite of its slightly misleading sub-title, feelings of grief and loss are not addressed. This is a valuable book for children at any stage. An unusual folk-tale from Chile, in which a childless old woman cares for a merchild until she must be returned to the sea. The Klimt-like pictures of the baby being breastfed and mothered are especially beautiful. A wistful story of unconditional love, loss and consolation. Old, wise, dependable Badger knows that he must soon die, and tries to prepare his woodland friends. Death is represented by a long tunnel through which Badger finds himself running and tumbling, leaving behind his infirm body. The animals are desperately unhappy, and a winter of desolate hibernation sets in. As spring arrives, they visit each other and talk about Badger, remembering the skills they learned from him, until in the warm days they can thank him for his ‘gifts’ and tell stories that make them all smile. The language is gentle and poetic, and the soft ink and watercolour pictures have a comforting echo of Ernest H. Shepard’s Wind in the Willows illustrations. 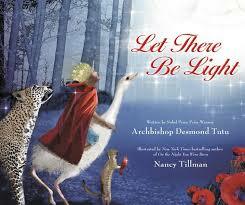 Ten children’s books with a spiritual dimension on the theme of Christmas. Thank you for the book cover images to Open Library, a non-profit project with the goal of providing a page on the web for every book ever published. Play & Pray by Epiphany Group Scotland is licensed under a Creative Commons Attribution-NonCommercial 4.0 International License.